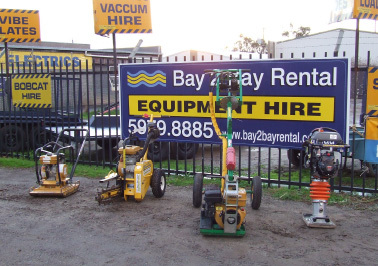 Located in Hastings, Bay 2 Bay Rental is here to service the Mornington Peninsula’s tool and equipment needs. We cater for builders and renovators, landscapers and gardeners, plumbers, electricians, tradesmen and many more. With expert advice and back-up service, we are with you every step of the way. All equipment, including our trailers are fully inspected prior to hire, to ensure trouble-free use. If there’s a break-down, we concentrate on replacing the machine as a priority, or have it repaired onsite ASAP. If not in stock, we endeavour to source the equipment elsewhere, and get it delivered to your site or to our Hastings yard for customer pick-up. Contact Bay 2 Bay Rental to make your next equipment hire hassle free! Are you a regular trade customer? Have you considered a trade account? Call us on 5979 8885 to see how a 'trade account' can save your business time and money with your equipment hire through Bay 2 Bay Rental! Do you need us to arrange equipment delivery or collection? We offer extremely competitive transport rates.